[194 Pages Report] The smart agriculture market was valued at USD 6.34 billion in 2017 and is expected to reach USD 13.50 billion by 2023, at a CAGR of 12.39% during the forecast period. The base year considered for this study is 2017, and the market forecast is provided for 2018–2023. In the smart agriculture market report, both top-down and bottom-up approaches have been used to estimate and validate the size of the smart agriculture market, along with other dependent submarkets. 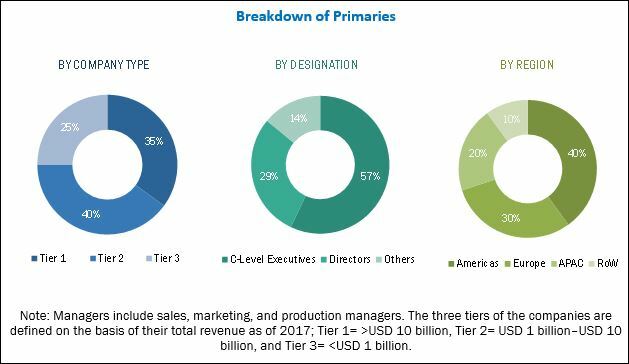 The key players in the smart agriculture market have been identified through secondary research, and their market share in the respective regions has been determined through primary and secondary research. This entire research methodology includes the study of annual and financial reports of the top players, as well as interviews with experts (such as CEOs, VPs, directors, and marketing executives) for key insights (both quantitative and qualitative). All percentage shares, splits, and breakdowns have been determined using secondary sources and verified through primary sources. All the possible parameters that affect the markets covered in this research study have been accounted for, viewed in detail, verified through primary research, and analyzed to obtain the final quantitative and qualitative data. This data has been consolidated and supplemented with detailed inputs and analysis from MarketsandMarkets and presented in this report. The ecosystem of the smart agriculture market comprises technology providers such as Deere & Company (US), Trimble (US), AGCO (US), AgJunction (US), Raven Industries (US), AG Leader (US), Precision Planting (US), The Climate Corporation (US), Descartes Labs (US), ec2ce (Spain), Gamaya (Switzerland), and Decisive Farming (Canada). The report also describes drivers, restraints, opportunities, and challenges impacting the growth of the smart agriculture market. In addition to the in-depth view on market segmentation, the report includes the critical market data and qualitative information for each type, along with qualitative analysis, such as value chain analysis, market ranking analysis, and competitive situations and trends. The report targets technology providers, software and service providers, system integrators, and end-user industries of the smart agriculture market. John Deere launched Intelligent Boom Control (IBC) for 1270G harvesters in North America. IBC provides operators with increased accuracy and productivity—bringing harvester capabilities to a whole new level. AGCO launched new product known as the Hesston by Massey Ferguson® 2370 Ultra High Density (UHD) Baler. The Model 2370 UHD baler has been created to meet the needs of large commercial hay growers. Raven industry partnered with South Dakota State University (SDSU) for the establishment of a smart agriculture facility in the SDSU campus. AGCO partnered with The Climate Corporation (a subsidiary of Monsanto Company). This partnership allows AGCO customers to connect with The Climate Corporation’s FieldView platform. John Deere acquired Blue River Technology (US) to enhance John Deere’s leadership position in smart agriculture market. This acquisition will allow John Deere to leverage technology and intellectual property developed by Blue River Technology. AGCO acquired Cimbria Holdings Limited (Denmark). Cimbria is a leading manufacturer of products and solutions for the processing, handling, and storage of seed and grain. This acquisition would significantly enhance the market position of AGCO Corporation in the grain handling and storage industry in Europe. The smart agriculture market is estimated to be worth USD 7.53 billion in 2018 and is projected to reach USD 13.50 billion by 2023, at a CAGR of 12.39% between 2018 and 2023. Major factors contributing to the growth of the smart agriculture market include the increasing adoption of advanced technologies in various agriculture applications such as precision farming, smart green house, livestock monitoring, and fish farm monitoring. Changing weather patterns due to increasing global warming have impelled the adoption of advanced farming technologies to enhance farm productivity and crop yield. Farmers or growers across the globe are increasingly adopting advanced farming devices and equipment such as steering and guidance, sensors, yield monitors, display devices, and farm management software. The smart agriculture market has been segmented on the basis of offering, type, application, and region. On the basis of offering, the smart agriculture market has been classified into hardware, software, and services. Hardware held the largest market share in 2017 owing to the high adoption of automation and control devices, such as drones/UAVs, GPS/GNSS, irrigation controllers, guidance and steering systems, yield monitors, and sensors. In the yield monitoring process, sensors and GPS devices play a vital role in measuring various yield parameters. It also uses GPS-based auto-guidance technology in agricultural vehicles to reduce the overlapping of equipment and tractor passes, thus saving fuel, labor, time, and soil compaction. Increasing demand for automation and control devices, and monitoring and sensing devices is the major factor that is likely to contribute to the growth of the smart agriculture market for hardware. Various applications pertaining to smart agriculture market include yield monitoring, field mapping, weather tracking and forecasting, feeding management, milk harvesting, fish tracking, and HVAC management. Yield monitoring is the most widely used application; as a result, this segment held the largest market size in 2017. Yield monitors can be a combination of various components such as mass flow sensors, moisture sensors, ground speed sensors, GPS receivers, and a task computer located nearby, which controls the integration and interaction of these components. On the basis of region, the smart agriculture market has been classified into the Americas, Europe, APAC, and RoW. The Americas held the largest share of the smart agriculture market in 2017. Countries such as the US and Canada in the Americas are the early adopters of smart agriculture technologies, which are the major reason for the high share of this region in the smart agriculture market. Farmers or growers in this region are increasingly adopting advanced farming systems and equipment such as steering and guidance systems, sensors, display devices, and farm management software. 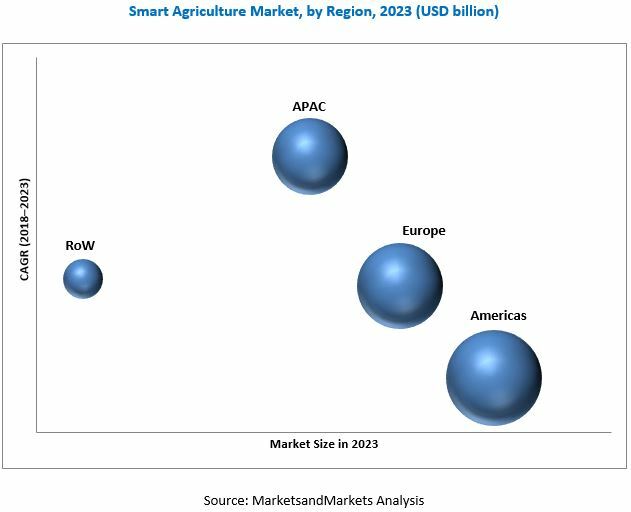 Key players in the smart agriculture market include Deere & Company (US), (Trimble) (US), AGCO (US), AgJunction (US), Raven Industries (US), AG Leader Technology (US), DeLaval (Sweden), GEA Group (Germany), Precision Planting (US), SST Development Group (US), Teejet Technologies (US), Topcon Positioning Systems (US), DICKEY-john Corporation (US), CropMetrics (US), Agribotix (US), The Climate Corporation (US), ec2ce (Spain), Descartes Labs (US), Gamaya (Switzerland), Granular (US), Prospera Technologies (Israel), Autonomous Tractor Corporation (US), Decisive Farming (Canada), Hexagon Agriculture (Brazil), and Autocopter Corp (US). These players adopted various strategies such as new product developments, mergers, partnerships, collaborations, and expansions to cater to customer demands. Internet of Things (IoT) and artificial intelligence (AI) are helping farmers and growers to optimize their crop yields and promote livestock health through remote monitoring and data-driven decision-making. Technologies such as machine learning, satellite imagery, variable rate technology, and advanced analytics are empowering small-holder farmers to increase their income through higher crop yield and greater price control. Big data are expected to have a large impact on smart farming and involves in every stage of food supply chain. Smart devices such as sensors, and GPS/GNSS produces large amount of data with unprecedented decision-making capabilities. As more and more smart devices and sensors are installed on the farms, agriculture practices will become increasingly data driven and data-enabled. Big data is expected to cause major shifts in transforming agriculture industry. New technologies such as internet of things and cloud computing are expected to leverage this development and introduce more robots and artificial intelligence in farming. Smartphone is the new agriculture tool. In the developing and developed countries, smartphones incorporated with multiple user-friendly applications (apps) related to agriculture are becoming popular among farmers. The agriculture-specific applications in smartphones provide all farming-related information to farmers, thereby helping them effectively use the information to make better decisions. The mobile applications cost lesser than the applications incorporated in devices such as laptops or computers. According to the Farm Journal Media Survey in February 2015, more than 60% of the farmers worldwide are already using smartphones and tablet computers. The use of smartphones among farmers has been steadily increasing since 2009, and this is expected to grow extensively in the coming years.